You can ride your bicycle for many of the errands you do during the week. Shopping for food is one of the most frequent trips we make, and many times it’s just for a few items that will fit into bike panniers or a basket, so why use your car for grocery trips? Most stores don't allow bikes in the store, so take a bike lock with you. 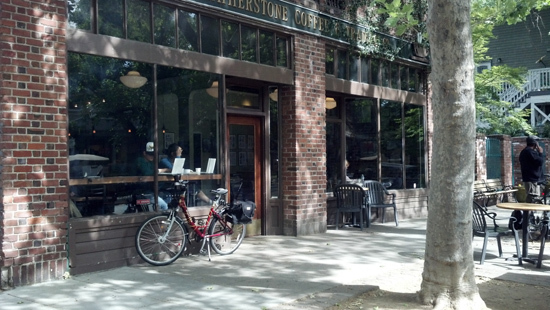 If you’re not sure where you’ll park your bike when you get there, call and ask if they have bike parking near the door. The bicycle at right is perfect for errands and shopping. The handlebars and seat put the rider in an upright position that is comfortable and makes it easy to scan to the side and behind. It has a bell, kickstand, fenders rear rack and four baskets: one on the front, one on the rack and two on the sides. Backpacks are inexpensive and convenient to have with you, but for longer trips or larger loads the weight can become uncomfortable. A small, (1200 cu in) backpack is a useful and comfortable size. It can carry a half gallon of milk, a half gallon of juice, some fruit, a loaf of bread. Look for wide, padded shoulder straps that are molded to the shape of your neck and shoulders. Padding to provide a cushion between your back and the load. A chest strap that connects the two shoulder straps, to spread the load evenly. A front basket is probably the easiest way to carry a small amount of groceries. Front baskets can be hooked over the handlebars or be permanently attached. Look for solid attachments to the bike that won't bend or work loose. Many baskets are sized specifically for grocery bags. Some can be easily removed from the bike and used as shopping baskets. 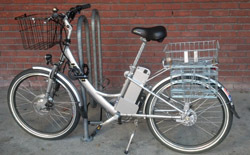 Panniers and rear baskets attach to a rear mounted bike rack. Both are good solutions for heavier loads because the weight does not interfere with steering and handling. A pair of (1200 cu in) panniers can usually carry an individual's weekly groceries. 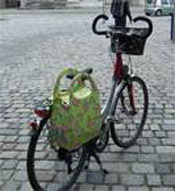 Some companies manufacture special “grocery bag” panniers. Look for panniers. that attach easily to the bike. You will have to hold your bike with one hand while you attach or remove the panniers with the other. Bike extensions such.as Xtracycle’s “FreeRadical” hitchless trailer is a unique device that extends the wheelbase of your existing bicycle and adds a long rack and panniers. The capacity of the panniers is much greater than conventional panniers, and the rack can carry very heavy loads. The extra weight of a load won’t actually affect the handling of your bike when you ride, even if you only put a load on one side of your bike, and you won’t find that it’s more work to pedal. Loads with a lower center of gravity affect handling the least which is why panniers on the sides of the back wheel work well. The main thing to watch for with panniers is that when the bike is stationary, the extra weight makes the bike cumbersome. A kickstand helps make this easier. If you ride with a backpack, adjust it so it doesn't prevent you from turning your head to see behind you. If you ride with panniers, make sure they’re attached well to the bike so the load doesn't shift. 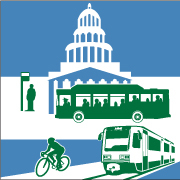 You may want to take quieter streets than you would if you were in a car, so plan your route ahead of time. Remember to make sure you have enough air in your tires to make pedaling easier and to prevent “pinch flats”. Look on the side wall of your tire for recommended pressures. And of course, have a small bag under the bike seat with basic bike tools: a pump, tire levers and a spare inner tube.